Low voltage lighting is your ticket to a lighting masterpiece. If you've got a deck, patio, landscape, garden or anything you want to show off but don't have the slightest clue about how to approach this monstrous lighting task, keep reading. 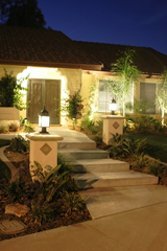 What is Low Voltage Outdoor Lighting? In today's market 12 volt incandescent lamps are the most common types of low voltage lamps available, however any system that runs on 50 volts or less is considered low voltage. It is not uncommon in outdoor lighting to use lamps that use 24 volts or even 5.5 volts. Normal house current in the United States is in the ballpark of 120 volts, so in order to power low voltage lighting you are going to need some help from a low voltage transformer. A low voltage transformer is a device that converts voltage from it's main source (your home) to be compatible to support lower voltages. Its use allows you to power fixtures, appliances, or anything designed to run off of less voltage without damaging the unit. Adding multiple low voltage lamps on one line is easy. Doing so gives you the flexibility to position your lights however you see fit. Installing outdoor lighting properly should always be done with care. The small and compact size of low voltage outdoor lighting fixtures makes them easy to hide without compromising light output. They are much more energy efficient than line voltage lighting, saving you money while also doing something good for the environment. Light output isn't overpowering so you won't be blinded by stong light light pollution produced by line voltage lights. Outdoor lamps are available in various different voltages that provided the low light levels needed in many circumstances. They can last much longer than line voltage lamps. They can be used in combination with a 120 volt systems to produce a desired result. Installing outdoor lighting for low voltage fixtures is much easier to perform. Low voltage outdoor lamps come in a variety of small sizes. Thats great news for designers like you and me because we can easily create a clean finished look and hide these fixtures without sacrificing light output. When deciding on which outdoor lighting fixtures to buy don't take the easy way out. Spend the money on quality fixtures, its money well spent. You don't want to be forced to keep replacing parts because you decided to save a few dollars on the front end. Its always best to find a place to mount the fixture that is out of people's view. The idea is to focus attention on what you want people to see, their surroundings not your lighting fixtures. If you can't hide a fixture, try to find one that blends into its surroundings. Lighting manufacturers make a whole slew of fixtures with different finishes. You could match them up to almost any outdoor environment without drawing too much attention them. Because of the wide variety of lamps available, it's easy to customize your project. You can choose any type of beam spread from very narrow and tight to wide and open. Most narrow and tight beam spreads are used as accent lighting. Maybe you want to draw your guest's attention to a particular object like a sculpture or fountain. A wide beam spread could be used as a form of flood lighting. Because this lighting is so energy efficient, a low voltage flood light would provide a decent amount of light without being too overpowering. Use it for outdoor garden lighting to accentuate the garden that you love. Be unique, fun, try something new for a change, get inspired. Use lighting to make your outdoors more enjoyable.